The hundred miler I entered last year is now seven weeks away…Seven weeks! But first, how absolutely lovely is it to finally have full on sunshine after so many weeks of doom and gloom and all that heavy snow in March?! 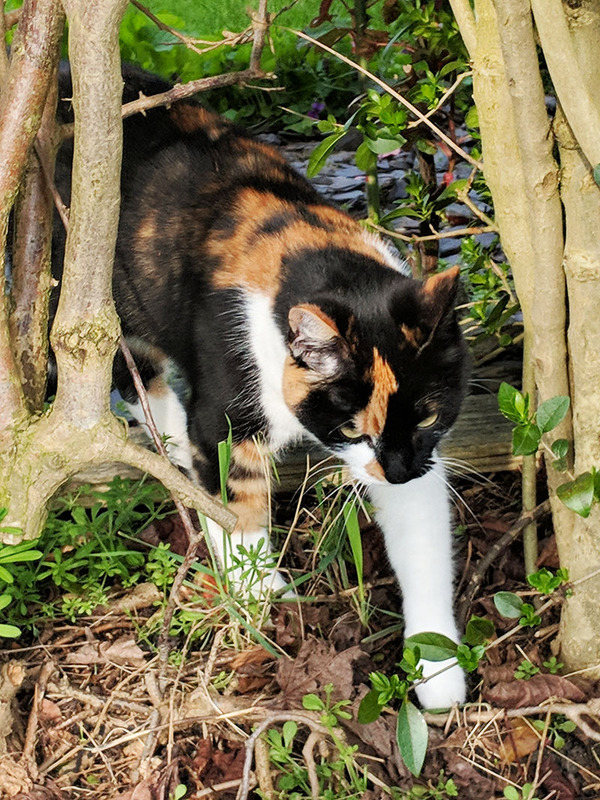 Oscar and I had a day out planned at a sand and water outdoor area a few miles away today but my car wouldn’t start this morning so I had to check it in at the garage – crushing our plans for the morning. 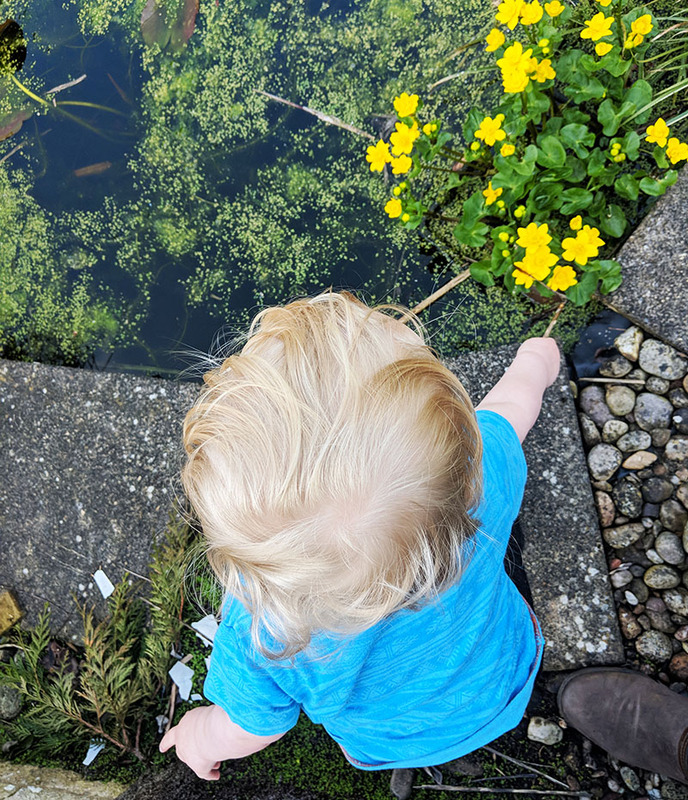 Although we couldn’t make it to the water park we did still make time to get outside in the garden this morning where Oscar happily held my hand for a good twenty minutes whilst stirring various sticks through the weed in our garden pond! 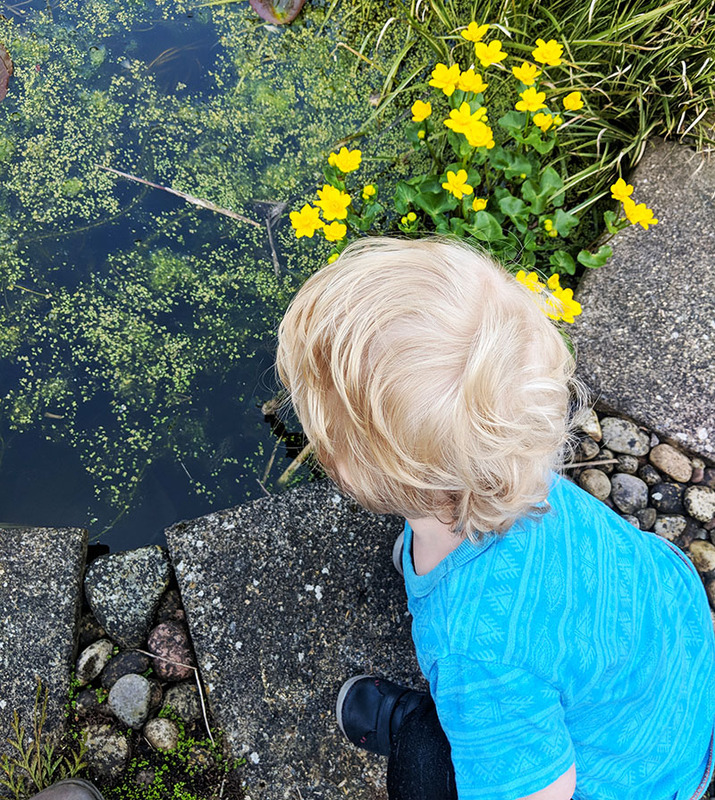 Our pond definitely needs a cover on it now that Oscar is toddling around and we hope to remove the monkey puzzle tree which has grown out of control at the back of the garden, putting everything to the right of the path to grass for Oscar to play on. Wish me luck. It’s going to be a big job over the next few months whilst trying to keep a very active toddler busy! Bella joined us outside earlier and rolled around in the sunny patches on the brickwork most of the morning! I can’t wait to get some sunshine trail miles in and Dan has promised that when he gets home from work this evening the three of us can head out on a family run with Oscar in the running buggy. Dan said that he would like to get some more running in the other week and now that the nights are lighter again as long as we head straight out as soon as he returns home from work (6:20pm-ish) we can fit 5-6 miles in before getting Oscar ready for bed. 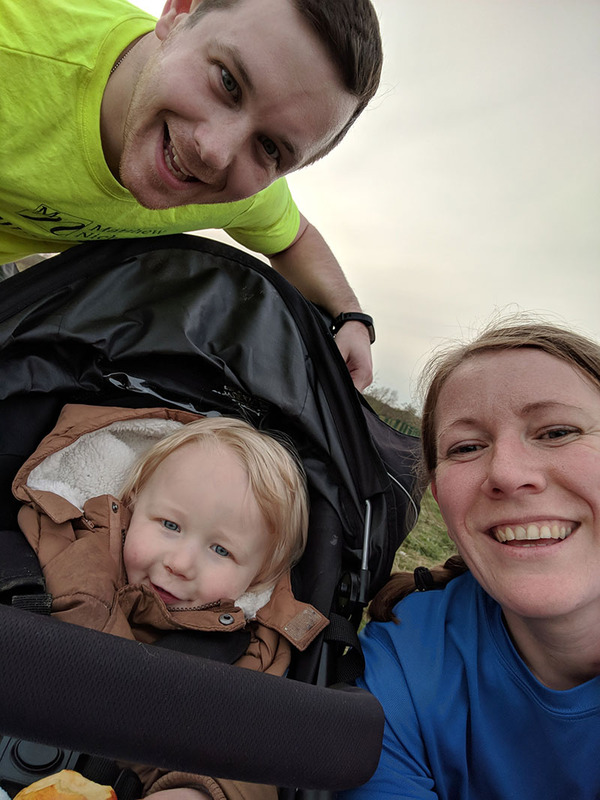 We went for our first family evening run together the week before I ran SDW50 and it was so nice to spend time together as a family whilst I was getting some miles in my legs. Oscar loves being out in the buggy with both of us and you can hear him constantly singing away and pointing things out that he can see along his ride! I did have my alarm set for another 5am wakeup call this morning, but a late night last night and backlog of lack of sleep over the past six months meant that my miles this morning needed to be replaced by an extra hour of sleep, so snoozed my alarm and rolled over for another hour instead. I have arranged to meet up with a few other ladies from the Run Mummy Run Facebook group for some early morning runs over the coming weeks and I’m hoping this will help to encourage me to get out for some of my miles first thing in the day. I much prefer running in the mornings and feel so much better for it for the rest of the day then. The poor weather and dark nights has meant that my early morning runs have been mainly on the treadmill this Winter, and there’s nothing more depressing than a solo treadmill run in a silent, dark house when you’re feeling tired! I’m looking forward to being able to chat running once more! Dan has also promised that he will ask at work if he can adjust his hours for a Thursday – meaning that he will start and finish earlier, giving him time to get home and take over Oscar from me, allowing me to get out on a club run in time. I’ve really missed running with other club runners since Dan has been at this job and I would love to be able to get back out there again. So, back at the end of last year when I sat down with my race calendar for 2018, achieving a marathon PB and completing a 100 mile ultra were the two big goals right at the very top of my list. Fast forward a few months and I am now less than three weeks away from running the Milton Keynes Marathon and less than eight weeks away from the South Downs Way 100. Following my performance at the SDW50 a fortnight ago I feel fully prepared for the 100. It was a real confidence boost that I achieved a time I hadn’t thought I was capable of, even though I didn’t actually ‘race’ the 50 event, slowing in places as I was concerned my calf injury might reappear. Touch wood, all being well, I am feeling fairly confident of completing the 100 at the start of June, provided no outsider issues ruin the day – heat, nutritional, etc. I’ve been talking tactics and times with some of the guys from my club who have finished the SDW100 in the past and every time it’s mentioned I can feel my excitement about the event continue to grow! The marathon is a different ball game though. Ultramarathons are all about tactics – getting your nutrition right and keeping moving, knowing which sections to walk and where to pick up the pace. Road marathons are a more pressured environment and can be time-driven. My continuous runs haven’t been very continuous and I haven’t completed as many longer runs as I would have liked throughout this training cycle. The plan I roughly put together for this training cycle was based very loosely on the Hanson’s Marathon Method and I am certain that this is a plan I would do well using when training solely for a marathon, – I just haven’t had the full opportunity to do so yet! Last year I ended up traveling back to Norfolk to visit my Mum several times during each week and this time round the plan could never have my full focus as the bigger goal has always been about running 100 miles. I want a sub 4h 30m marathon this year, but I don’t think I will achieve that at Milton Keynes next month, and I don’t want to break myself by trying. I no longer plan on tapering for the marathon and instead plan to treat it as a long training run (with other people, and a shiny new medal!). I have been running strongly on my runs, and so, (with a current marathon PB I am aware doesn’t do my running justice) know that a new PB is perhaps possible even if I don’t ‘race’ the event as such. But if not, that’s OK too. My new target for the sub 4h 30m marathon is going to be a marathon at the end of September/start of October (still to decide which one) meaning I will be able to focus on solid training purely for the marathon over the Summer months when I won’t be persuaded to run other races (as it will be out of race season) and when I will be able to run outside rather than on the treadmill for the majority of my runs as it is already light by 6am in the mornings. Have you changed your goal races for the season before? Do you prefer Summer or Winter running? 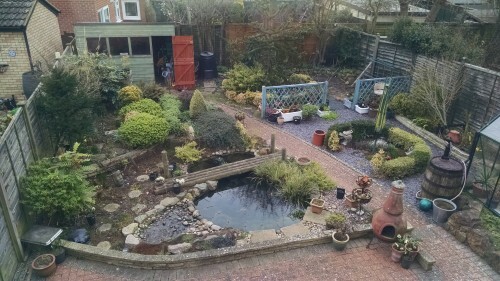 How is your garden currently looking after such a rough Winter?